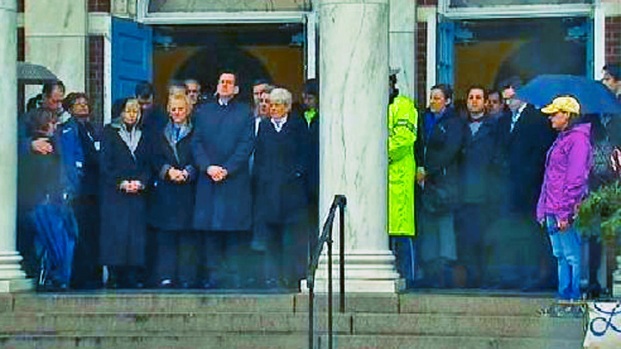 Exactly one week after a gunman burst into a Connecticut elementary school and killed 20 first-graders and six educators, the nation paused for a moment of silence and tolled bells 26 times for the victims. Connecticut Gov. Dannel Malloy gathered with other officials on the steps of the Edmond Town Hall as the bell there rang for each life lost at Sandy Hook Elementary. Similar commemorations took place throughout the country. At the White House, President Barack Obama privately observed the moment of silence. In Newtown on Friday, traffic stopped outside the town hall as bells tolled. "When I heard the 26 bells ring it just melted my soul," said Kerrie Glassman of Sandy Hook who said she knew seven of the victims. "It's just overwhelming. You just can't believe this happened in our town." The nation paused for a moment of silence Friday as bells tolled for each of the 20 children and six adults slain in a Newtown elementary school by an assault rifle-wielding gunman one week ago. Mourners on Friday were attending the funerals of school psychologist Mary Sherlach, 56, and 29-year-old Rachel D'Avino, a behavior therapist, as well as three more children: Olivia Rose Engel, whose family described her as a happy 6-year-old child with a great sense of humor; Grace McDonnell, 7, whose family released pink and purple balloons after her service; and 6-year-old Dylan Hockley, who played tag every morning at the bus stop with neighbors. His family lived on the same street as the gunman, Adam Lanza, and his mother, Nancy. Nancy Lanza was fatally shot in her home by her son before police say he drove to Sandy Hook Elementary and opened fire, killing 20 children and six adults. 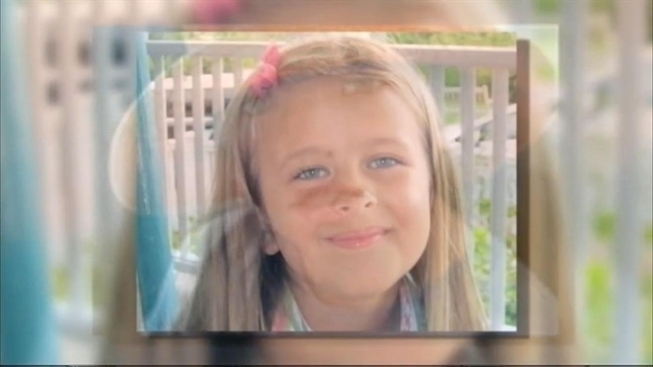 She was remembered at a private funeral Thursday, a New Hampshire police source told NBC News. Four more child victims were laid to rest Thursday, including Catherine Hubbard, whose family said in her obituary that she would be remembered for her passion for animals and her constant smile. Anne Marie Murphy and Lauren Rousseau, two teachers killed in last week's school shooting in Newtown, Conn., were laid to rest Thursday. Greg Cergol reports. Funerals were also held in Connecticut for Benjamin Andrew Wheeler, an avid soccer player and pianist; 6-year-old Jesse Lewis, who enjoyed hot chocolate with his breakfast sandwich; and Allison Wyatt, a 6-year-old girl who loved gardening. In New York, Cardinal Timothy Dolan told mourners at the funeral of Anne Marie Murphy that the teacher "brought together a community, a nation, a world, now awed by her own life and death." Murphy's father, Hugh McGowan, said authorities told him that she died trying to protect her young pupils. "Like Jesus, Annie laid down her life for her friends," Dolan said. "Like Jesus, Annie's life and death brings light, truth, goodness and love to a world often shrouded in darkness, evil, selfishness and death." Funerals were held today for Daniel Barden, Charlotte Bacon, and Caroline Previdi. Greg Cergol reports. In downtown Danbury, mourners filed into the ornate white-pillared First Congregational Church for a memorial service for 30-year-old teacher Lauren Rousseau. The congregation in the packed church sang "Morning Has Broken" and "Let There Be Peace on Earth" as friends remembered the spirited, hardworking, sunny-natured young woman who loved children and animals, especially cats, and who had always wanted to be a teacher.